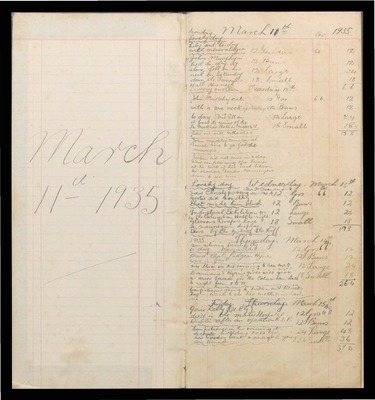 Ledger detailing bread received between March 1935 and May 1936 at Griffins's Bakers and Confectioners, 21 Shop Street, Galway. Ledger recording of breads received between November 1928 and June 1932 at Griffin's Bakers and Confectioners, 21 Shop Street, Galway. Ledger detailing bread received from November 1924 to November 1928 at Griffin's Bakers and Confectioners, 21 Shop Street, Galway. 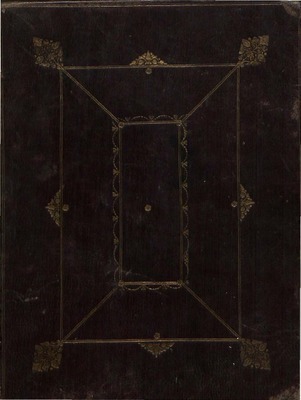 This book was started by Mary Ogle (sometimes called Marie) in 1713. She was the daughter of the Reverend Honourable Samuel Ogle, M.P. for Berswick and Commissioner of Revenue for Ireland who resided at Bowsden, North Cumberland and Stephen’s Green with his wife Elizabeth Pringle Dawson. Mary married Captain John Broughton of Maidstone, Kent in 1720 and their daughter Mary was born in Jersey in 1724. She was an heiress and married Edward Donovan, Barrister at Law, of Ballymore, Co. Wexford and 24, Peter Street, Dublin in 1747. They had 21 children, sixteen lived and five died unbaptized. Perhaps, some of her daughters wrote down some of the recipes, as the family would have employed cooks down through the generations. Their eldest son Richard inherited Ballymore Estate and married Anne Richards, daughter of Goddard Richards at Grange, Co. Wexford. There is little known about her except they were living in Ballymore in 1798 and had to flee to Dublin and did not return for some time. In turn, their son, also Richard married Frances Westby of High Park, Kiltegan, Co. Wicklow in 1816. Their big interest was gardening and they laid out the walled garden and built a large greenhouse at Ballymore. Richard was supposed to be able to identify varieties of apples by their pips. The next Richard married Agnes Elizabeth Wynne, born in 1829 in Geneva. Her father Henry, a clergyman lived at Ardcrendrick, Wexford. She was more interested in the arts and travelling around Europe. They employed many cooks over the years. The next generation, another Richard married Constance Elinor Lillingston, daughter of Alfred from Southwold, Suffolk. They met at a tennis party on Kilkenny. She came to Ballymore in 1888 and remained there all her life. She died in 1937 having looked after the place for 21 years as a widow. Constance wrote most of the recipes in the latter part of the book. After her death Phoebe, her youngest daughter looked after the house. She had no interest in cooking as painting was her life. Finally, Phoebe’s brother Richard married Margaret Edith Mackay from Oban, Scotland in 1926. They never lived at Ballymore, only for extended holidays as he was in the Navy from an early age. He contracted tuberculosis while commanding submarines, and as part of his treatment they went to Florida where Margaret’s father had an orange plantation - hence, the last entry of an American recipe. It was written with her son’s help, as she was nearly blind at the age of 93. This book may have been kept in Peter Street until 1857, when the house was sold and became part of the Adelaide Hospital. It has survived a fire in 1955 and remains in the small library at Ballymore.